It's raining bush frogs in India! 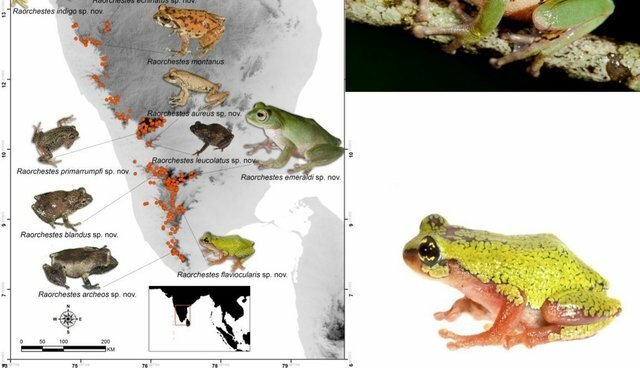 Researchers from the Indian Institute of Science recently described nine new species of bush frogs (aka miniature tree frogs)! These species were discovered when the conservationists were addressing the lack of data ("Wallacean shortfall") on the geographical distribution of small vertebrates in the Western Ghats Region of India. With support from the Critical Ecosystem Partnership Fund (CEPF), the Indian Institute of Science completed systematic field assessments of poorly known taxa of key reptile and amphibian species in the Western Ghats, developed predictive distribution modeling, and produced field guides from the results, which will be integrated into other conservation planning and priority-setting exercises. Established in 2000, the Critical Ecosystem Partnership Fund (CEPF) is a global leader in enabling civil society to participate in and influence the conservation of some of the world's most critical ecosystems. CEPF is a joint initiative of l'Agence Française de Développement (AFD), Conservation International, the Global Environment Facility (GEF), the Government of Japan, the John D. and Catherine T. MacArthur Foundation, and the World Bank.